Steven Motlop was a solid contributor for the Power with 28 disposals, seven inside 50s, seven score involvements and a matchhigh 612 metres gained. Charlie Dixon has had a big final quarter with six disposals and three goals, all of which have come in the last five minutes of game time. Dixon has 16 disposals and four goals for the match. David Armitage can hold his head high for the Saints. He has had 30 disposals, 15 contested possessions, five clearances and three goals. Tom Rockliff has played arguably one of his best games in a Port Adelaide jumper, amassing 30 disposals, 15 contested possessions and seven inside 50s. The competition average for turnovers per game is 72. Already tonight the Saints have had 83 turnovers and the Power have had 75 turnovers. Port Adelaide has scored 7.11.53 from these intercepts compared to St Kilda's 5.6.36. With the Saints applying the pressure, Justin Westhoff's final quarter to date has been important. He has six disposals for the term, with five of them coming via intercept possessions. Port Adelaide's 128 disposals in the third quarter was its highest disposal tally in any quarter this season, eclipsing the 124 disposals it recorded in the first quarter of its Round 6 encounter with North Melbourne. Jade Gresham has been important for St Kilda when they have had the ball. He has had 14 disposals, with seven of them being inside 50s. Gresham also has five score involvements and four score assists. Port Adelaide has generated 17 inside 50s to five this term and have enjoyed 78 per cent time in forward half, but have kicked a wasteful 3.6.24 to 1.0.6 from this dominance, which includes 2.5.17 from intercept possessions. St Kilda's kicking efficiency has been a problem all afternoon, going at just 53 per cent by foot for the match. The Saints rank 12th this season for kicking efficiency, going at 64 per cent by foot this season. 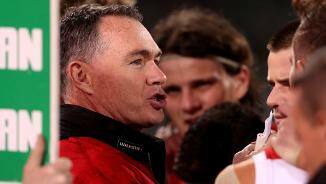 Since quarter time the Power have won the tackle count 36 to 24 and inside 50s 25 to 12. Power InterchangeTom Jonas and is possibly out for the game. Port Adelaide has the first four clearances of the third term with two coming directly from hitouts-to-advantage by Paddy Ryder. 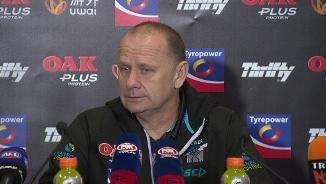 Port Adelaide holds a narrow advantage in contested possession 77 to 72. Sam PowellPepper is relishing the contest, with 10 of his 12 disposals coming via a contested possession, while Tom Rockliff has had nine contested possessions for the Power. 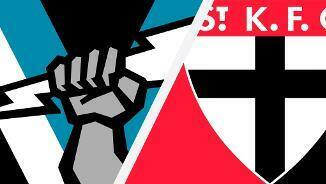 Port Adelaide leads St Kilda 4.6.30 to 1.4.10 from scores from turnovers. The Power have been particularly effective at generating forward half turnovers with 3.5.23 coming via 19 forward half turnovers. After conceding 13 consecutive inside 50s, the Saints have kicked two goals from the last three entries of the match, both to David Armitage. Port Adelaide has recorded the last 13 inside 50s of the match and have enjoyed 81 per cent time in forward half for the term. The Power finally get a goal on the board. They lead inside 50s 10 to four for the term, including the last nine of the match. It is Port Adelaide's turn to miss shots at goal, kicking 0.3.3 for the quarter, making it a combined 0.8.8 from both sides to the left of screen. After laying just five tackles in the opening term, Port Adelaide has already laid seven tackles to start this quarter. Port Adelaide converts just 17 per cent of its defensive 50 chains into inside 50s, ranked 17th in the competition. It is a similar story thus far this afternoon with just one of its 18 defensive 50 chains resulting in an inside 50. Port Adelaide has kicked its entire score of 3.1.19 on the back of St Kilda turnovers. Likewise, the Saints have kicked four of their five scores (all behinds) from Port Adelaide turnovers. Port Adelaide averages nine more tackles per game than its opposition this season, ranked No.1 in the competition. They have laid just six tackles for the quarter and trail the Saints by seven in this area. 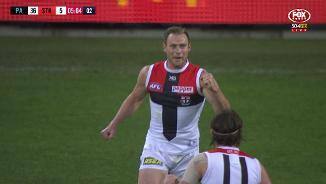 St Kilda leads the tackle count 10 to two and have had the last five inside 50s of the match, but have been wasteful, kicking 0.4.4. They have a goal kicking accuracy of just 51 per cent this season, ranked last in the competition. The kicking efficiency hasn't improved with Port Adelaide kicking at 51 per cent and the Saints kicking at 47 per cent. Both teams are burning the ball by foot early. Port Adelaide is kicking at an efficiency of 55 per cent, while the Saints are going at just 44 per cent by foot. 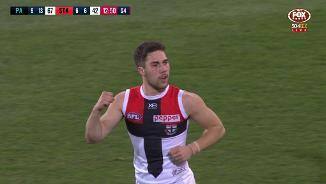 Saints InterchangePaddy McCartin off due to an injury. Port Adelaide have the first four inside 50s and first two clearances of the match. The Power rank fifth in the AFL for inside 50 differential and fourth in the AFL for clearance differential. The Saints have taken a mark and immediately played on 39 per cent of the time this season, the highest rate recorded by any side. St Kilda has allowed its opposition to score from 48 per cent of their inside 50 entries this season, the highest percentage of any side. The Power have won the time in possession differential by two minutes and 35 seconds per game this season, ranked second in the AFL. 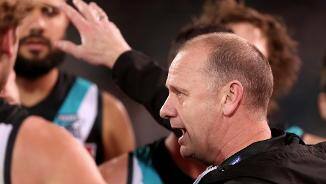 Port Adelaide has won the uncontested possession count by 30 per game this season, ranked No.1 in the AFL. Welcome to Adelaide Oval for the Port Adelaide v St Kilda Round 16 clash. PORT Adelaide has moved to second on the ladder with a comfortable 36-point victory against St Kilda at Adelaide Oval on Saturday. In front of a crowd of 36,253, the Power were never seriously challenged as they won their fifth consecutive game for the first time since early 2014. Key forward Charlie Dixon booted four goals, including three in the last quarter, as the Power cruised home 12.14 (86) to 7.8 (50), but the big blow was a knee injury to star defender Tom Jonas. Jonas' left knee was twisted in a tackle in the third quarter and he didn't take any further part in the match. Tom Jonas won't return after hurting his knee in this third-quarter contest. Chad Wingard, Tom Rockliff, Sam Powell-Pepper and Steven Motlop (in his 150th game) did plenty of damage through the midfield, recruit Jack Watts looked sharp in his first game from a stint in the SANFL and defender Darcy Byrne-Jones, in his first game back after he was punished for being late to a training session, was busy across half-back. "We didn't play as well as we would like, but it was pretty solid by the end and we still won the game pretty well," Power coach Ken Hinkley said. "Never going to lose the game, which was pleasing. "You take the win, we're 11-4 and move on." After back-to-back wins over Gold Coast and Melbourne, the Saints were solid without looking like they were on the Power's level. Veteran David Armitage was outstanding with 30 disposals and three goals, Jade Gresham continued his purple patch of form with two goals and eight inside 50s, while Jack Steele – who kept Ollie Wines to 18 disposals while having 26 himself - and Luke Dunstan worked hard through the midfield. 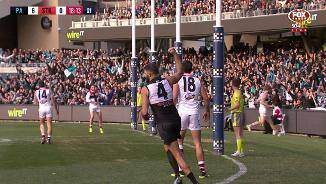 In a first half devoid of many highlights, Paddy Ryder's brilliant roving goal from the pocket was the standout piece of play. 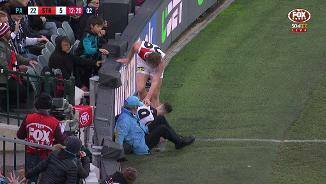 The Power ruckman snatched the ball off his bootlaces before producing a perfect grubber kick from tight on the boundary. Is he the ruckman or the rover? It was slim pickings after that, both sides combining for 7.12 from 19 scoring shots as skill errors were the order of the day. The Power booted the first five goals of the game before Armitage kicked two quick ones – the first when he intercepted a horror kick from Dan Houston, and the second from a free kick – to have the Saints trailing by 18 points, 5.6 (36) to 2.6 (18) at half-time. Dixon then began exerting his influence on the game. The Power key forward tapped the ball down to Robbie Gray, whose slick handpass found Travis Boak for an open snap on goal. 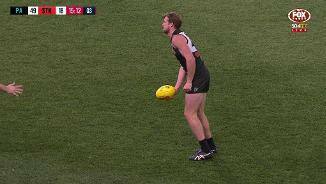 Dixon again brought the ball to ground leading to a Justin Westhoff goal, the Power extending their lead to 30 points. 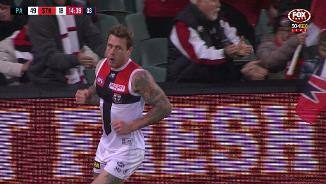 Just as the Saints started to slip away, a beautiful long kick from Gresham gave Tim Membrey an unimpeded run into an open goalsquare. The Saints go through the guts slice through the Power! 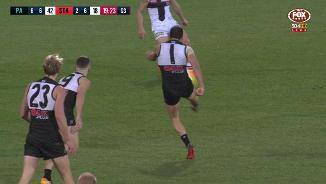 Gresham hit the scoreboard twice – gleefully accepting Jared Polec's horrible cross-field kick, then another from a snap – to keep the Saints within striking distance. But a couple of late goals from Dixon sealed the result. 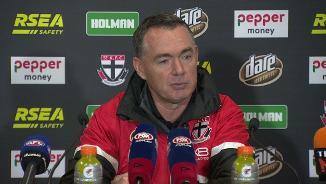 "Both teams made mistakes, they were better than us," Saints coach Alan Richardson said. "I was pleased that we were able to limit their scoring up until half-time, even though they had shots, to go in still with an opportunity for victory. 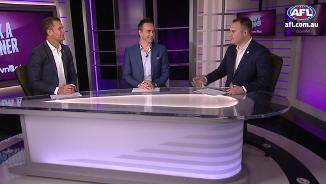 "Straight after halftime they were able to do a bit of damage." 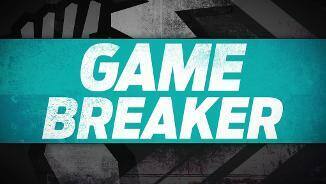 Port Adelaide: Could be bad news for key defender Tom Jonas, who left in the game at the 13-minute mark of the third quarter with a knee injury. Jonas' left knee was twisted as he was tackled. "We don't know exactly what that will look like. He'll get scanned and we'll make some decisions from there. At this stage, he didn't finish the game, so he's got a significant injury that might put him out for a little bit of time, we don't know," Power coach Ken Hinkley said. St Kilda: The Saints reported a clean bill of health. The Power will attempt to win their sixth straight game when they head west to face Fremantle at Optus Stadium next Sunday, 2.40pm (AWST). Meanwhile, the Saints host Carlton on Friday night at Etihad Stadium, 7.50pm (AEST).